Well school is officially out, my girl scout troop has bridged up the brownies, the garden is growing and the weather here in the Pacific North West is much hotter than normal…yup summer has arrived like a relative kicking in the front door. BAM! For some these day dreams include the beach, the smell of coconut oil and the sounds of waves and seagulls. Others may think of breathing mountain air, the sounds of woodpeckers and walking through a forest. But my family’s day dreams mostly consist of eating a Dole Whip from Disneyland while washing our hands at the kitchen sink for the 6th time that day with that island pineapple scented foaming soap from Bath & Body works. 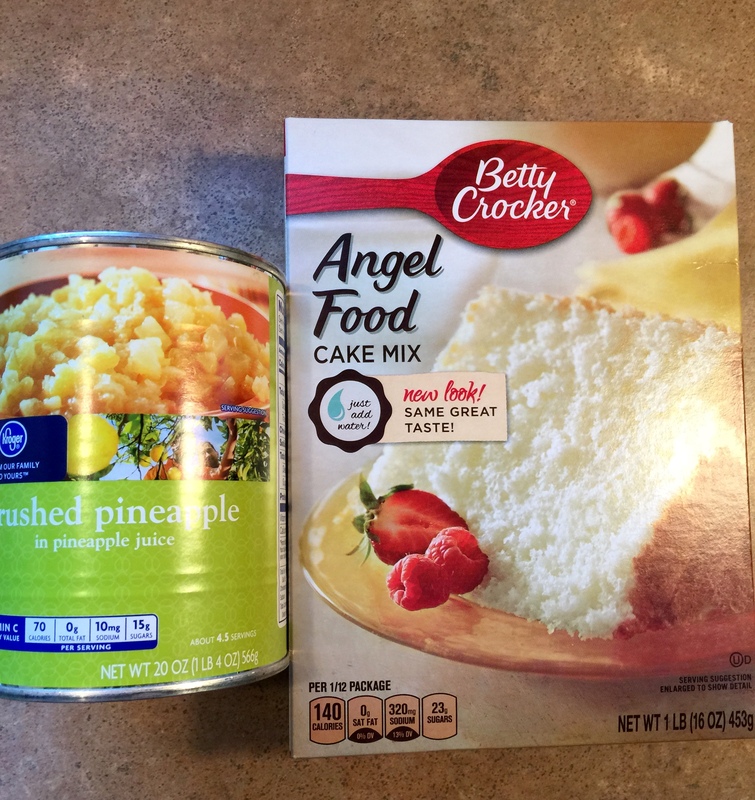 So, I was digging around in my pile of recipes to see if I could make a low fat (weight watcher friendly version) of something that had that pineapple flare to it. 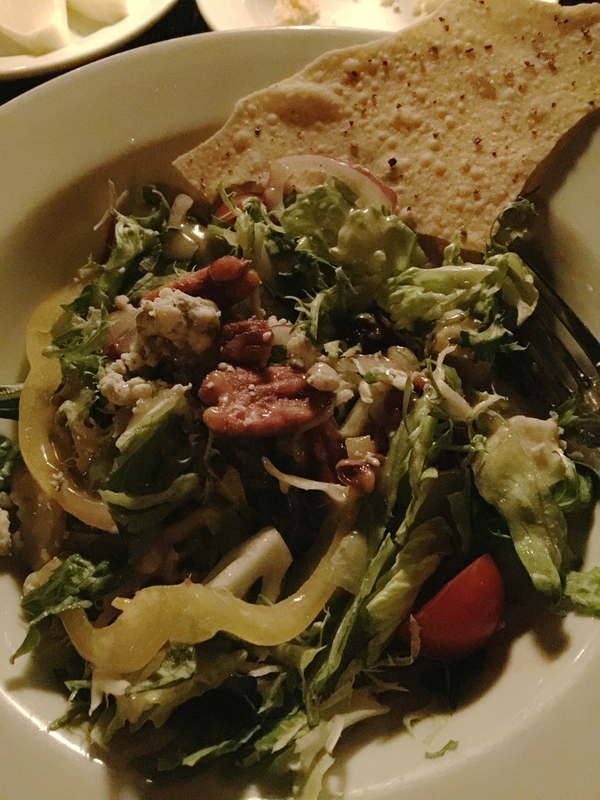 Something to make that was different, refreshing, healthy and satisfying. 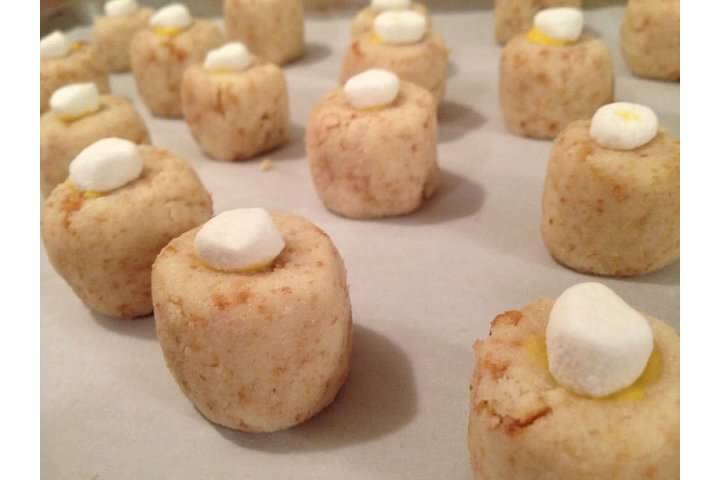 I finally came across a recipe that is an oldie but goodie. My mom used to make it years ago and after talking to a few fellow weight watcher meeting pals they have heard of it too but never tried it. 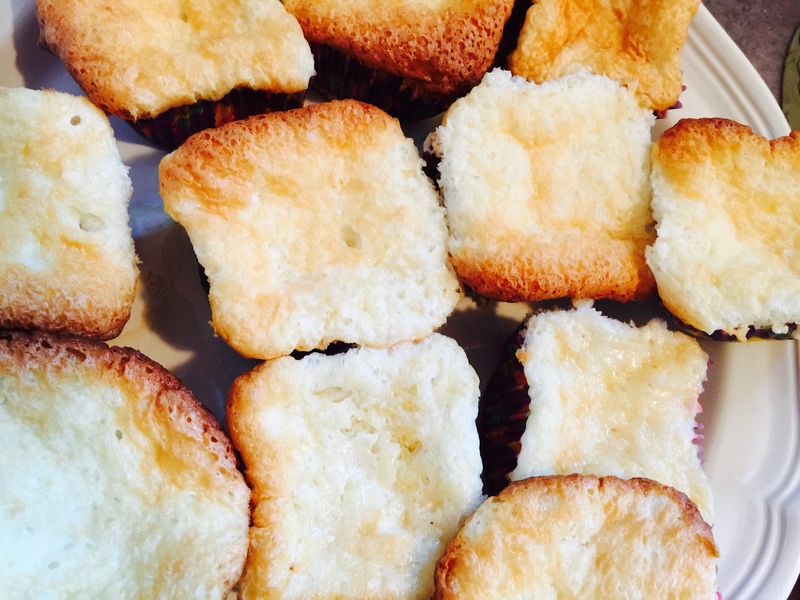 It’s such an easy recipe, and the little cakes are so good they feel like a little treat but are not overly sweet that they taste great for a snack. 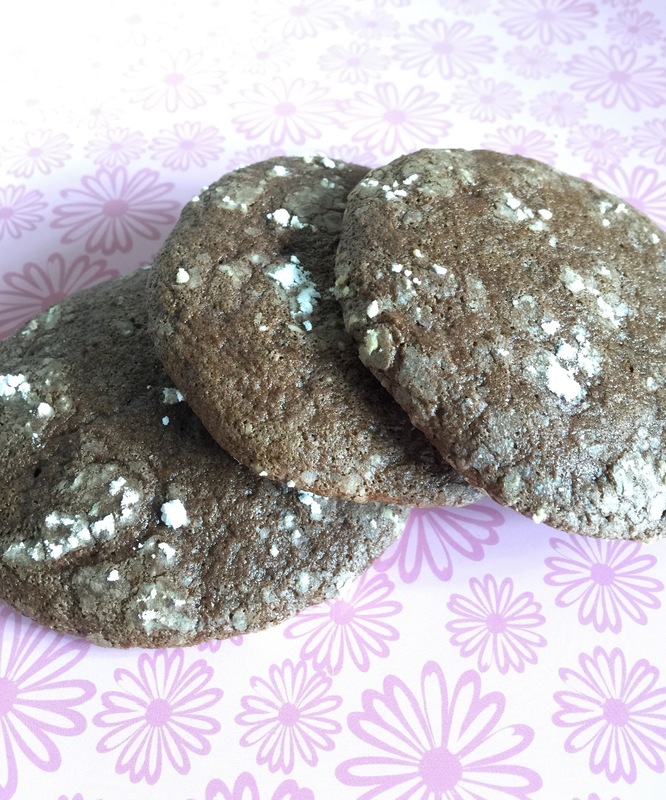 A great thing about this recipe…it’s only 2 ingredients and thats it! But the best thing ever about this recipe is that each “cake” or”muffin” (whatever you call it) is only 1 ww pts+!!! 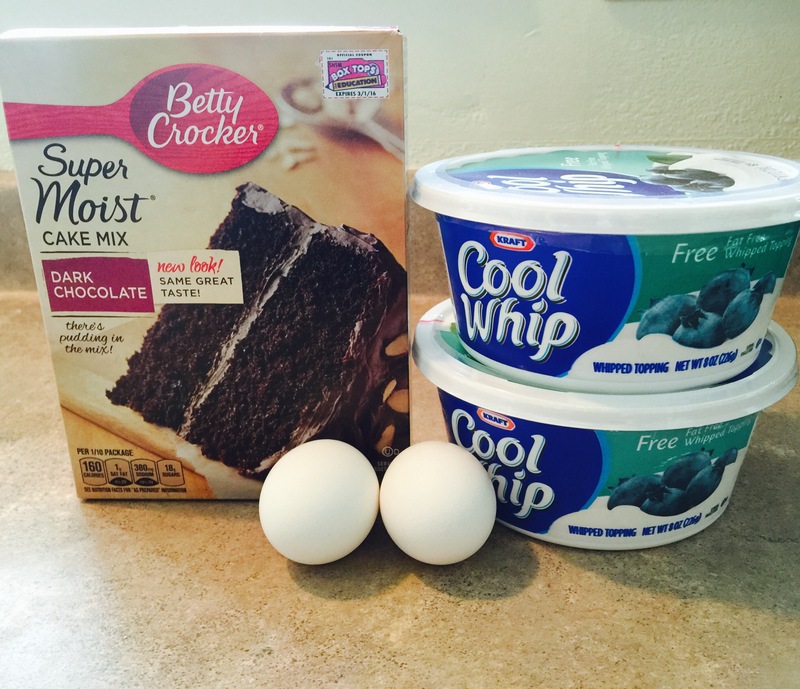 Mix both ingredients together well in large bowl. Scoop mix into 24 cupcake lined muffin or brownie pans. 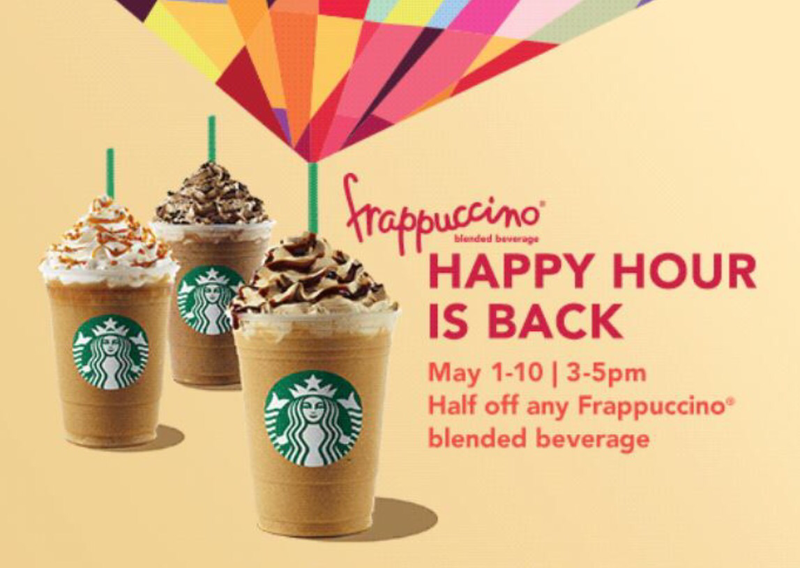 From May 1-10th between 3-5pm (until 6pm for us Starbucks rewards members👍) you can enjoy and size Frappuccino at half price. 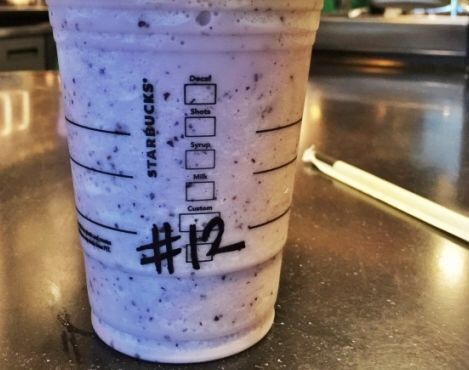 You could even try the new S’mores Frappuccino they have. I have not tried it yet (I’ve been waiting to get one half off) but have heard it is a very sweet drink. The past month or two I have been trying to plan out the details for our family vacation to Disneyland. 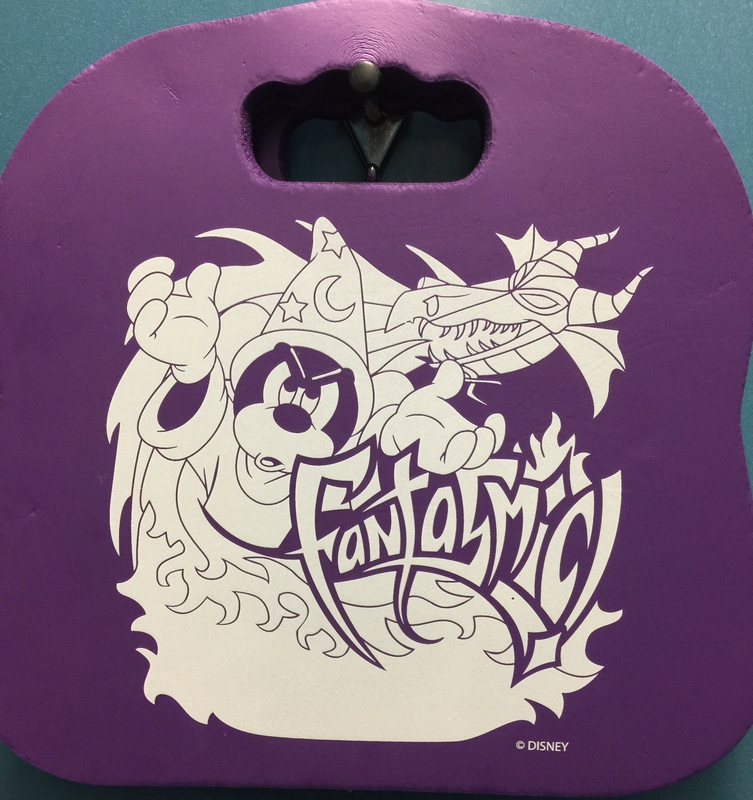 One of the shows we really were really looking forward to seeing is Fantasmic! Little Diva has never seen it before and we wanted to make her first time at the show extra special and fun. So I have been looking at the new Fantasmic Dining Packages Disneyland now offers. 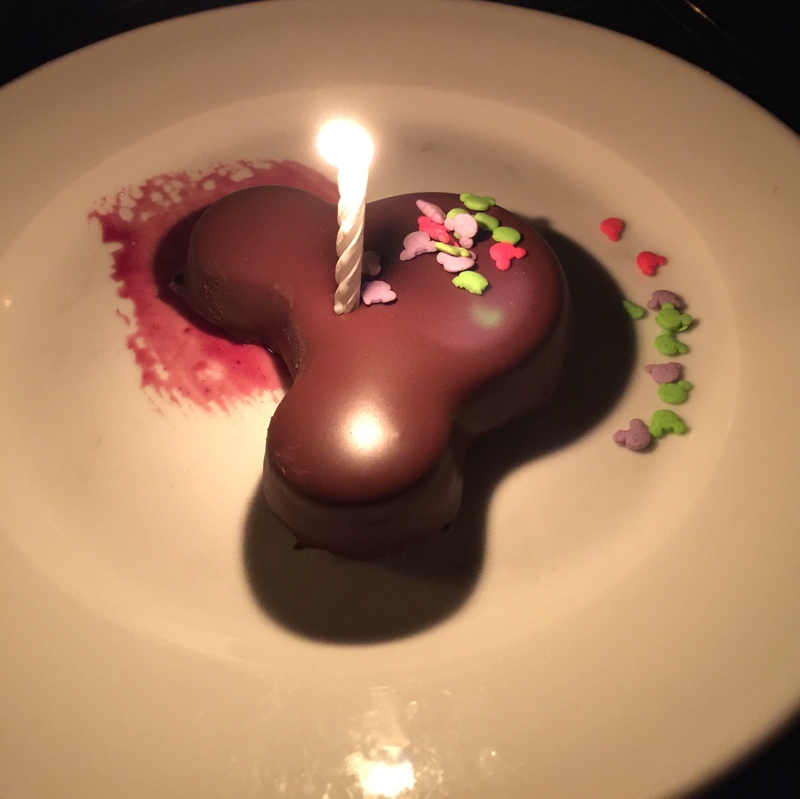 There is some info on online on different types such as to-go meals, dessert only (not offered currently due the construction in Critter Country) and full 3 course dinner. 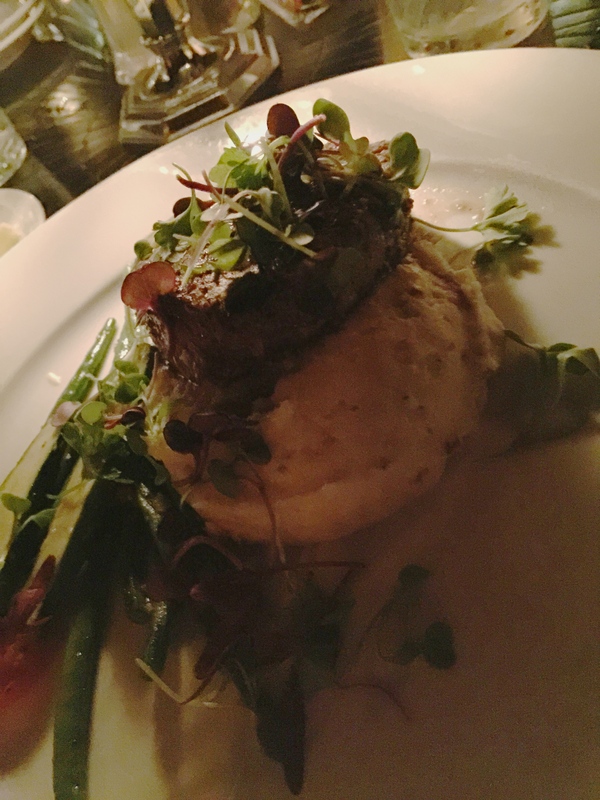 However, I couldn’t find and info on exactly what your meal options and prices would be for the full dinners offered at River Belle Terrace and especially at The Blue Bayou. Also the full dinners you enjoy before or after the actual showing of Fantasmic. You do not eat and watch the show simultaneously…as some people would assume. Most of us Disney lovers probably understand that we won’t be able to eat dinner at The Blue Bayou while listening to someone riding Pirates of the Caribbean shouting “throw me a roll!” and watch Fantsmic on the Rivers of America all at the same time…but not all of us are die hard Disneyland fans and some have never been to DL before. The hubby said lets just try the Blue Bayou Restaurant Fantasmic dinner option and make our trip even more special for us and Little Diva! I am happy to report we had a great time! 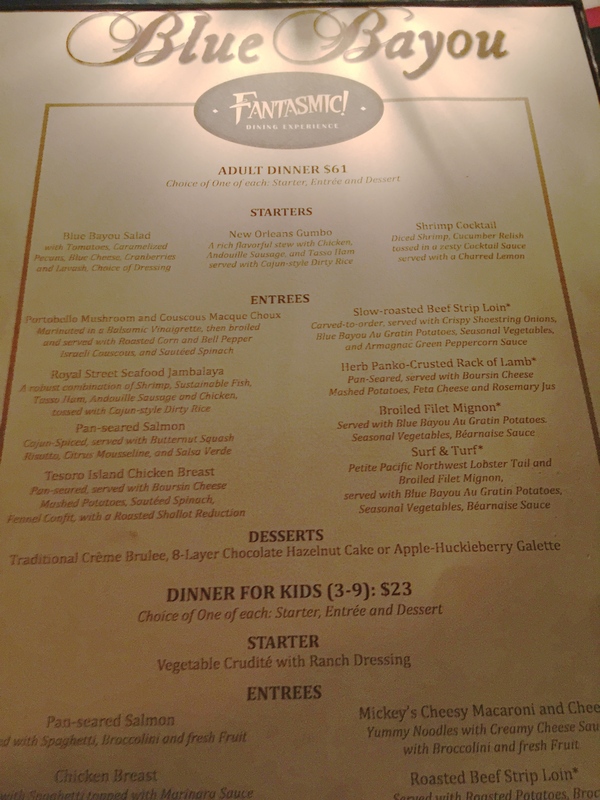 It did seem a little expensive when we first booked our Fantasmic dinning reservation. 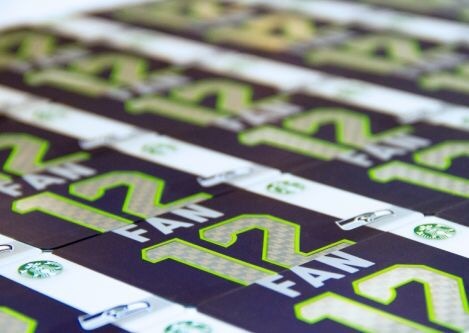 However, we all enjoyed our meal so much and our seats for Fanstamic were just plain awesome it felt worth the price! #2 Check the weather report. Although some think of Southern California having nothing but sunshine it actually can does rain a little and can have some big windy days. They can cancel the showing of Fantasmic at any time and no they do not give out refunds for dining packages. #3 There is a 24 hour cancellation policy. Yes you can cancel your reservation with no penalty as long as it’s 24 hours before your reservation time. Otherwise, they will charge you a $10 fee for not showing up to your reserved time. #4 Arrive to your dining reservation hungry. I know that should be a given but I overheard a few people/children saying “I shouldn’t have just eaten that Dole Whip”or”I’m really not that hungry now” etc. Try and plan out your day accordingly. 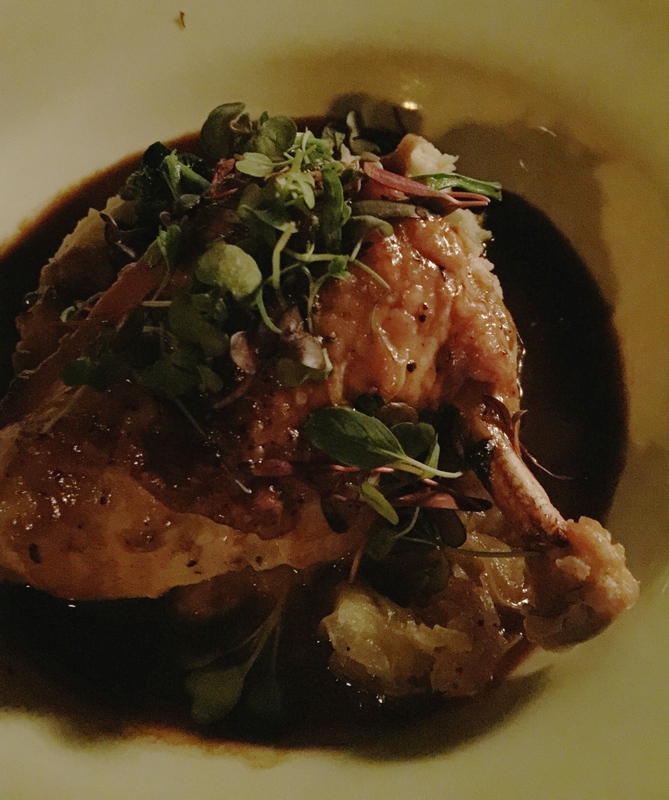 Also try and book a late lunch/early dinner or late dinner for your reservation time…you get a lot of yummy food. 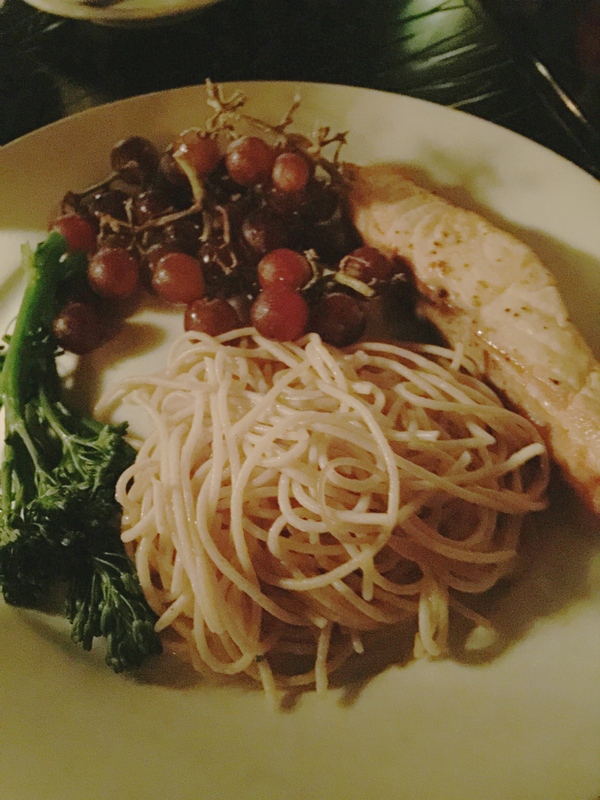 Ok now for the good stuff…food pics! 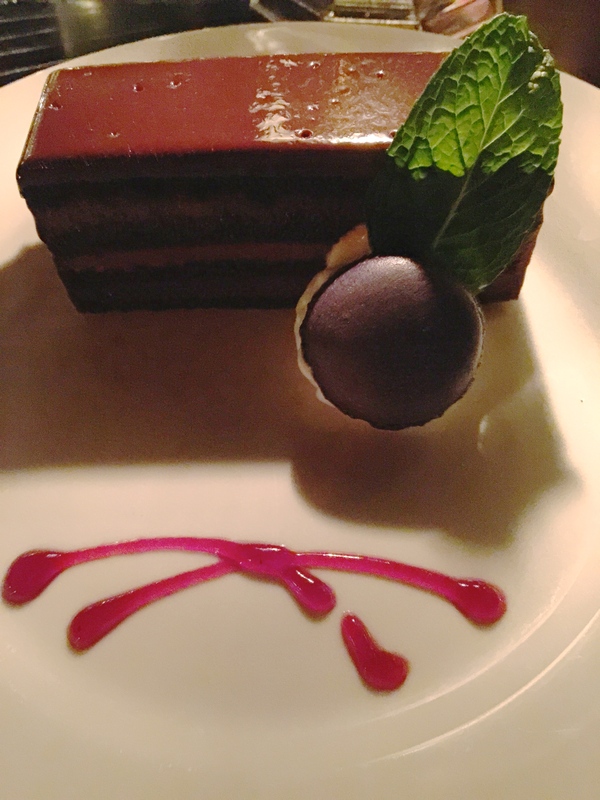 ….and then there was dessert!! 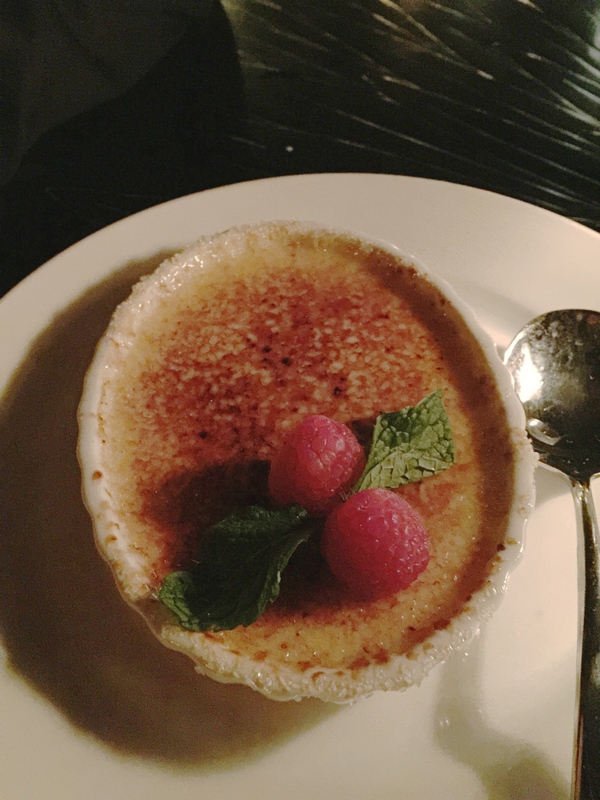 I really hope this post has assisted you in some Fantasmic Dinning questions! 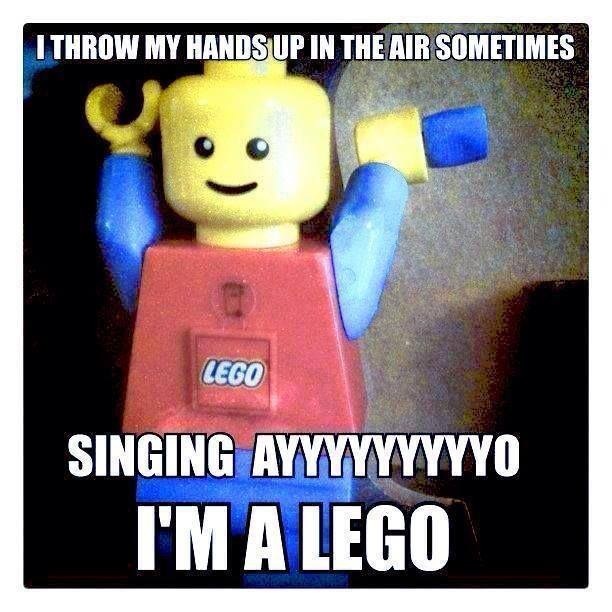 Lego…yup, my kid is in love with most things that has that word in it. It’s ok though, she probably inherited the love for them from myself and her father. I remember back in the day building all types of structures so my Lego figures could capture some My Little Ponies…those were the days. 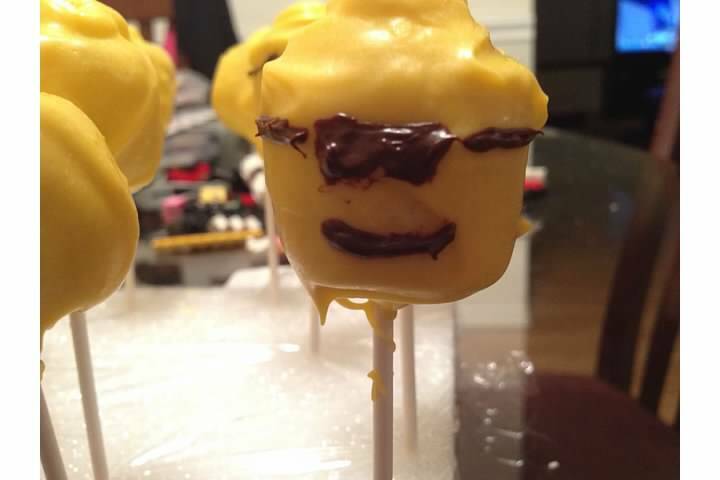 I caution you…I have never attempted to make cake pops in my life. 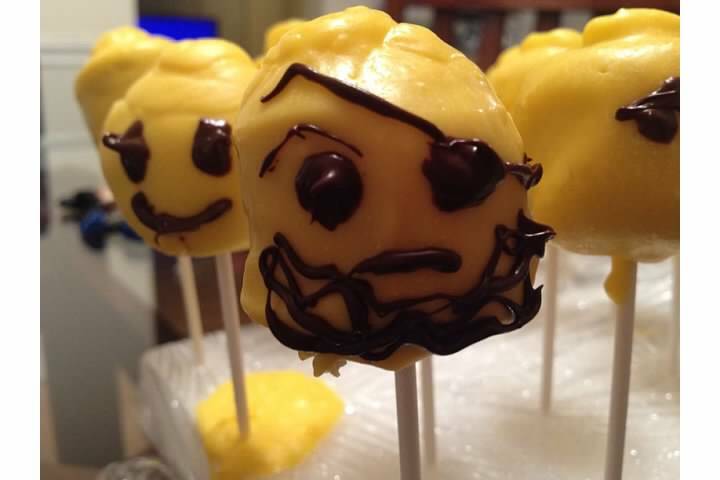 I also am not a night owl, and making these cake pops took a few hours longer into the night than I anticipated. You have been warned! 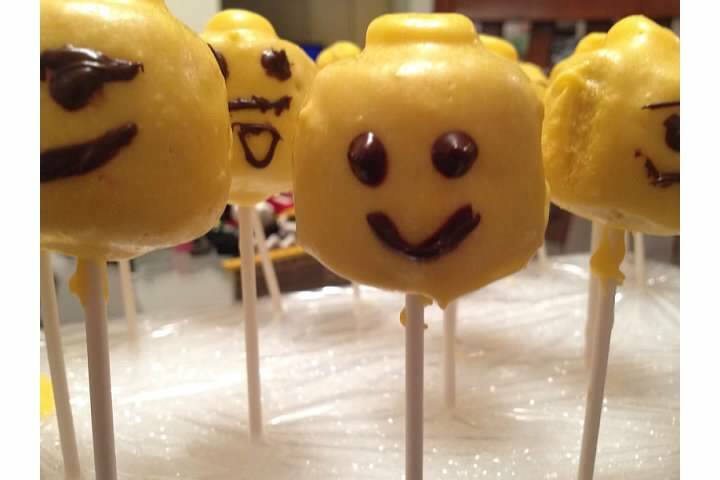 So as a result, because I had no idea what I was doing, my Lego cake pops turned out…well…let’s call them “rustic” (a polite way of saying “crappy” right?) In my defense it was a little last minute, and I was up way too late trying to make them, and had no idea what I was doing. 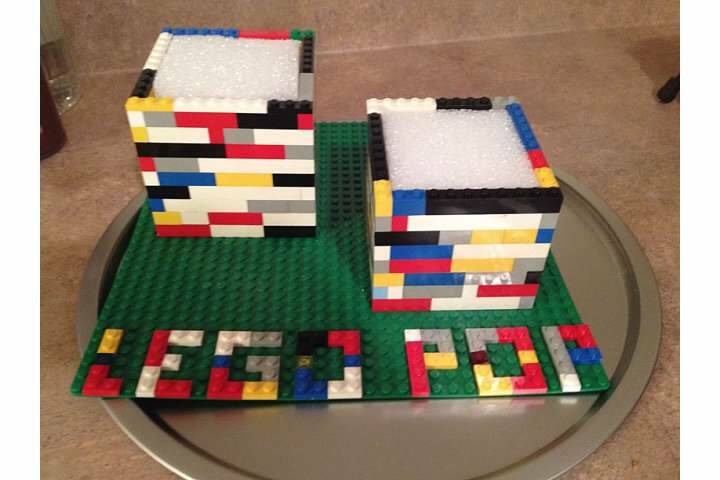 Anyway, here are a few pictures of the different steps I took to attempt these “Lego Pops”. -Make the cake as directed for a 9 x 13” pan. Bake and cool. -Then (after you did all that) destroy it by dumping the whole cake into a huge bowl and crumble it up with your hands. Yes…Im serious. -After your cake is in crumbs, add about half of the can of frosting, mix it all together well. If the mix seems too crumbly or dry add a little more frosting. If the mixture is super sticky you can chill in fridge for a bit. -Next form small balls to the desired size for your cake pop. 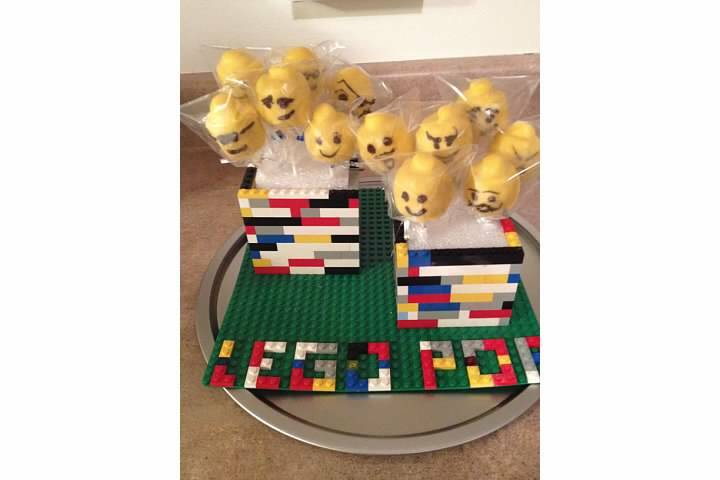 Put some pressure on the side of the cake ball to give it that Lego head shape. Place on pan lined with parchment paper. -Now melt the candy melts. I didn’t have on of those special candy melt mini crockpots I’ve seen so I just put a bowl over a small pot of boiling water. 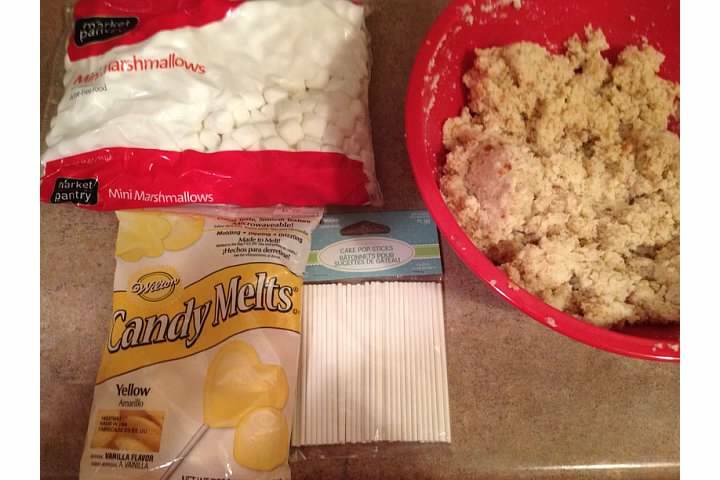 -While melting the candy melts, cut a handful of mini marshmallows in half with scissors, put aside. -Once candy melts are melted, dip just the tip of the cake pop stick in the candy melt and insert the stick it into your cake pop. This helps the stick stay in place a bit better. -After all the sticks are in place, put the tray of cake pops in the fridge to fully set. -Once fully set, place your cake pops up right. I used a piece of styrofoam from my local craft store but an upside down box with holes would work too. -Grab your cut marshmallows. Place a dot of melted candy melt onto one side and stick it to the top of each cake pop. Now it’s starting to look like a Lego head? 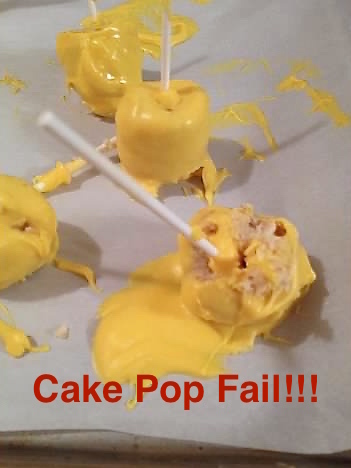 -So take a cake pop and “swirl” it into the melted candy melts, making sure the whole cake pop is covered. Then lightly tap the stick to try and get off any extra melting candy. Then set upright in a holder or styrofoam to cool. Repeat for all pops. -Now my food marker I had planned on using to make the “faces” soooooo did not work. This was my end result…not what I had pictured in my mind at all, but they were just going to have to work. I covered each pop with a little bag and put them in a little holder my husband put together with my childhood Legos. He just built a Lego wall around two small pieces of styrofoam so the pops would stay upright. So in the end it all came together I guess, I wasn’t too impressed on how they came out honestly. But the next morning Little Diva got up and ran straight to the kitchen to see the pops, and she just smiled and smiled. She loved them so much! Your Starbucks can now go nutty….coconut that is! Starbucks coconut milk is certified vegan and made from single-origin coconuts from the tropical Indonesian island of Sumatra.